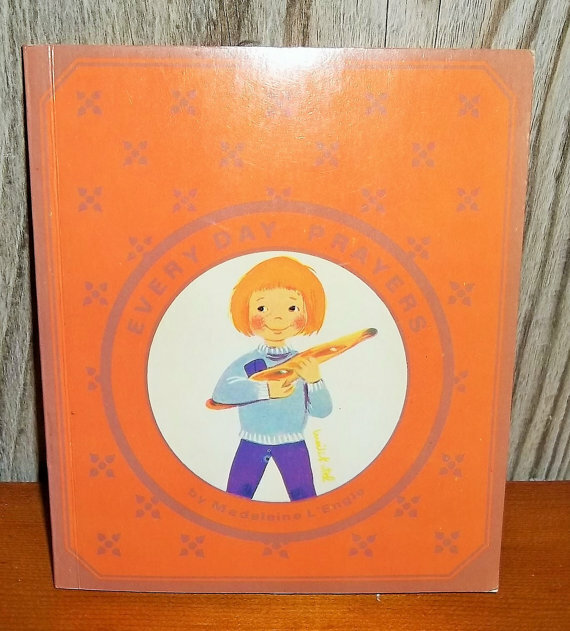 On a whim (and for the bargain price of ten cents), I picked up Madeleine L’Engle’s Everyday Prayers at our local thrift shop a couple of years ago. I love it. Yes, I’d prefer it if it only used “God” instead of “Lord,” but even as is, with its 70s illustrations (by Lucile Butel) and orange cover, it’s worth a read (both for its intended audience – children – and the grown folks who love them). It’s a reminder that prayer can be like an informal conversation, full of observation and wonder and whimsy. under water and bring them up again. and continents appearing and disappearing. Tonight, Boy decided that he’d take on the role of the creator or perhaps that of the earth, one who creates the churnings and splashings. He picked up the book (it’s one he goes to again and again – he also loves to pick up Sophie’s World!) and, instead of turning to a page, he flung it into the tub. The tub which was full of water, ready for a Boy, not a book. For a brief moment, it was an island, a quiet place of prayer in a stormy sea. I quickly rescued it from the tempest. He did not seem sorry. Boy is sweet at night, adding prayers for everything from the grandparents to the clock to lots of things in between. and you have a good night, too. Everyday Prayers now sits beneath a heavier book, drying back into what I hope will be something close to its previous form. 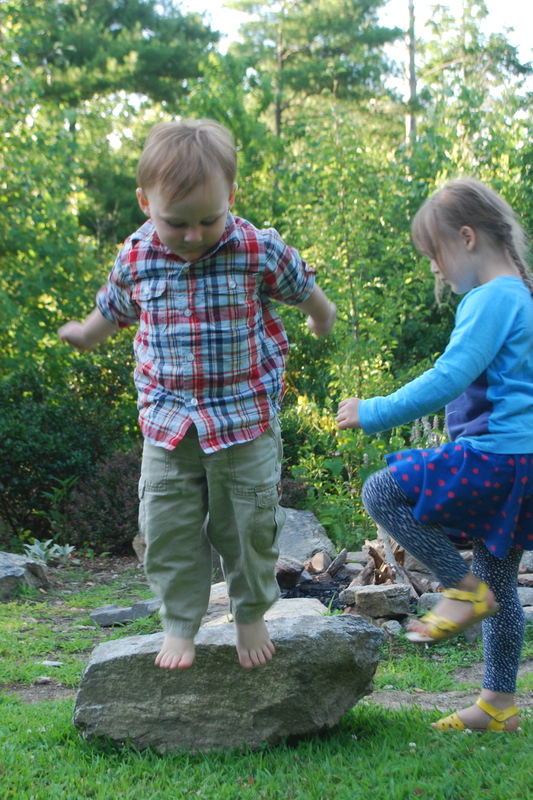 The boy sleeps, and I have to hope that God understands the nature of little boys – and is, as Madeleine L’Engle wrote, having a good night, too. L’Engle, Madeleine. Everyday Prayers. New York: Morehouse-Barlow Co., 1974. Print. Sometimes there’s so much going on, I don’t know which way is up: our parents’ health, our parents’ moving, travel plans, possible moves, events in the lives of family and friends, and so many other odds-and-ends of things that in the end it all seems odd and up in the air. But that’s not even the best of our toilet stories for the moment. Two days ago – or was it three? – Boy announced, “I peed like Daddy!” He’s taken to standing on the little stool in front of the big potty, which is a big change from all the sitting he’s been doing. After finishing, flushing, and washing hands, he came out, grabbed his daddy by the hand, and said, “I need help getting my undies!” and pulled him to the bathroom. Boy’s getting better about dressing himself (“I like to do it my own self” is a favorite line when putting on a shirt), but sometimes he needs help. The undies in question, however, were nowhere to be seen. No undies on the floor, no undies on the stool. No undies in the bathroom, period. “I want my undies!” he cried. He took Matthew to the toilet. And that is where they’d gone, taking their final journey, may they rest in peace: down the toilet. “Even if they could come back, you wouldn’t want them,” Matthew told him. Nope, he wouldn’t. Sure, we told him not to flush things down the toilet (last week, he unrolled nearly a whole roll of toilet paper, said he’d roll it back up, but instead started putting it all in the toilet. Yes, it clogged the toilet, even after the not-so-wet bunch was transferred to the trash can). No, we don’t support the idea that clothing is disposable. Yes, parenting can be tiring. What we do appreciate at this point, though, is that they TELL us. I could have done without the extra bathroom trips this afternoon. I’d prefer to keep our clothing in the house and not somewhere in a pipe outside (not very useful as extra storage). For now, however, I take comfort in knowing that our children share their experiences, let us know their needs, and don’t really keep things from us. If we can keep what should go down down and what should stay up up, then we’ll be doing OK. But maybe we’ll need to go underwear shopping soon. Yesterday was Tuesday. 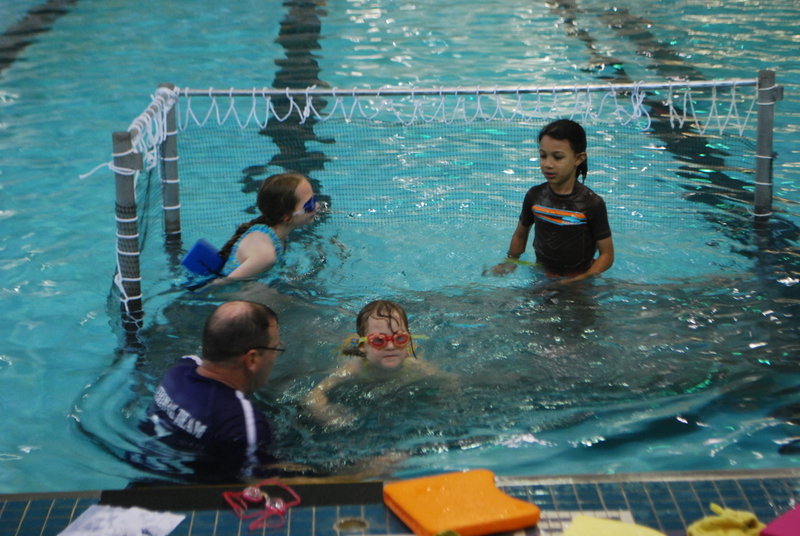 Seven days of swim lessons were behind Girl – this year. Last year, after two weeks, I was ready to sign her up for the next session to further her progress. “Wait ’til next year,” Coach Max said then. “She can’t do anything else until she’s ready to put her face in the water.” He might have said it would be a waste of time to sign her up for another session, but memory can be a strange and fuzzy thing. Oh. Scratch that plan. One round of swim lessons in 2014: yes. One swimmer: no. She’s five now. I wish I could say that she’s taken off, that she dips her head below the water like an ice cream cone being dipped in chocolate. I can’t. Or if I can, it would be a disappointingly dunked cone, one that would make a little kid sad. However, she did touch the bottom of the pool yesterday, fully submerged, before popping above the surface. One fully covered cone! I told her that she was doing great, of course, because she was. “Only two more days left!” I said on our way to the car. “Tomorrow is our penultimate day!” she announced. “Yes, it is,” I agreed. “Yes, it is.” Leaps and bounds, this girl, leaps and bounds. Make that splashes and bubbles.